I've always wondered why Tibetans could be so healthy when they seem to subsist on a diet composed of dairy and meat, perhaps with the odd potato thrown on the fire. 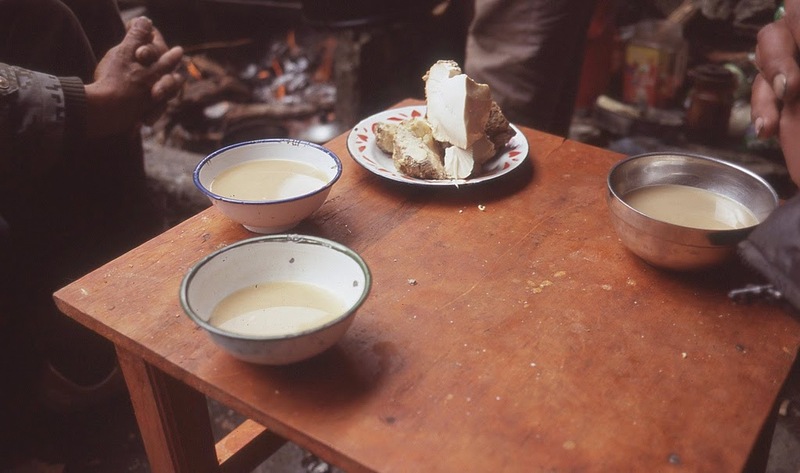 One of the staples of the Tibetan diet is tsampa - the butter 'tea' which is more like a salty yak butter tea-milkshake. This is not your EasyWay shake - tsampa is made with barley and is often accompanied by a glob of fermented yak milk sometimes known as kurut - similar to the products seen in Xinjiang. Now it seems there is a hidden healthy component of Tibetan dairy products that has powerful antihypertensive properties, as strong as the drugs prescribed by western cardiologists. The blood pressure lowering effects come from the fermented milks produced by 259 Lactobacillus helveticus - a kind of probiotic ACE inhibitor if you like. Something in the Lactobacillus has potent effects on Angiotensin Converting Enzyme (ACE), the same system that is the target of modern antihypertensives such as enalapril. In a recent study conducted by dairy technologists at the Inner Mongolia Agricultural University, Huhho, the fermented milk product was found to contain antihypertensive peptides that lower blood pressure by about 12 mmHg for six to 12 hours. That is fairly impressive BP lowering - and would be useful in a typical hypertensive patient with a systolic BP of 140/95mmHg who wanted to get to a target of 120mmHg. As well as keeping Tibetans healthy, Dr Chen Yongfu and colleagues say the newly-identified probiotic/peptide may have potential as "a valuable resource for future development of functional foods for hypertension management."